The second best Christmas gift delivery entity, after Santa Claus, at least in Catalonia, is as you well know by now, Mr. Caga Tio, expression that in the English world is timidly translated as Pooping Log. Let's not fool ourselves, in Catalan it means, shitting log. Once clarified such euphemistic interpretation, let us proceed. Compared to Santa, alias Noel, or Nicholas, Caga Tió is less handsome and much more sun dried in appearance, a hard looking fellow, not very valid for Christmas shopping publicity campaigns! First of all, let us make one thing clear, a tió is different from tio which means 'uncle'. 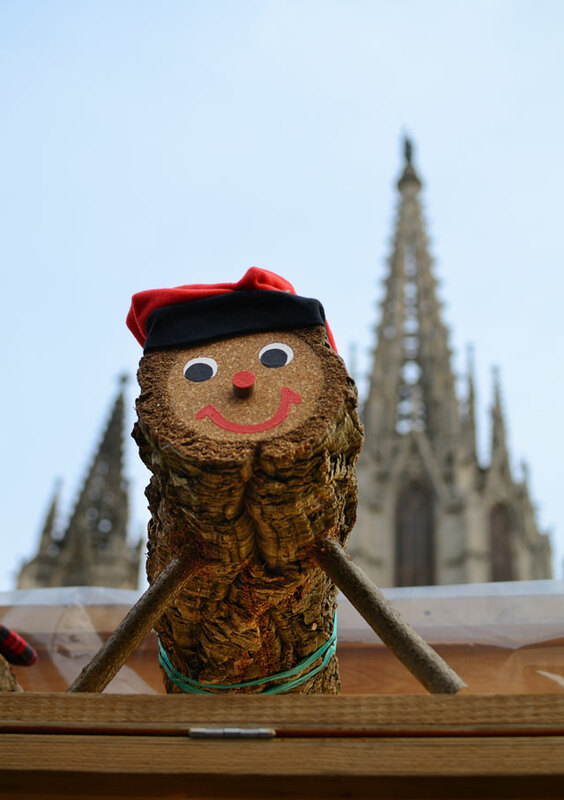 In Catalan, a tió is a big log.. And so this is the story of a log, a big thick chunk, that since time immemorial has been chosen from a pile of wood in the farm houses, called masias here in Catalonia, to make a fire to stand the hardships of winter. It was not any kind of log though. Usually it was a soca, that is a tree stump. There was a point in time, in which that stump, which was burning from December to January, was not only a mute comrade of oh so many winter nights, but eventually became an object of veneration and its ashes were scattered around the house and the fields as a sort of offering to the sun and the benediction of crops. It must be said that nativity festive celebrations didn't start till IV century AC to celebrate the birth of baby Jesus but the cult of the burning log in your hearth, is a pagan ritual that started way back in time. When did the log turn into a small buddy with barretina (traditional Catalan hat) and four legs? It seems that it all began as recently as XVIII or XIX centuries, in the mountainous rural areas of Catalonia. People decided that this figure would no longer have to be burned, but it was supposed to be at home safe and sound, for kids to beat with a stick at will and which eventually would yield presents, like a mother delivers a son, or the earth gives her fruit. Caga tio, I would say, is a cheap kind of Christmas in itself. What is the liturgy around caga tio? In the most pure Pagan way and with permission of Christianity, the child log, is laid somewhere in the house and is pampered by parents and children alike by providing him with food to later cover him with a blanket and hit him mercilessly while singing a popular song, like a tribe honoring some deity. After the punishment, the poor wooden figure, plays to be God, and showing forgiveness, gives out presents among parishioners, in this case, elated kids. When is Caga Tió supposed to materialize at home? Our Christmas log, though ugly, is the antithesis of Mr. Scrooge, he, (or she) represents generosity, love and couldn't be more of a familiar guy, as he is supposed to be at the house from December 8th until Christmas day. Not like his always busy, polar partner, that is almost late for the party every year. What particular presents does 'el tío' bring? According to the song, Caga Tío brings, almonds and nougat when it is well fed and happy, but herrings or other salty stuff at the end of his hard laboring or if hungry. Kids are sent to another room, in theory to pray, after each beating. In the meantime, parents do their thing so the log keeps giving birth till exhausted. What do Catalans expect from Caga Tió this season? Well, this question goes out of the script but we might as well ask tío more than just presents. I ask him to give us a wise solution to the Catalan problem, a nice candidate we can root for in coming elections and the demise of the current Spanish corrupt government. In a way, they think we are a Christmas log that is generous after being beaten to death, but every God, has his own wrath, so one day we will give them what they deserve, and what should be yielded by a pooping log.